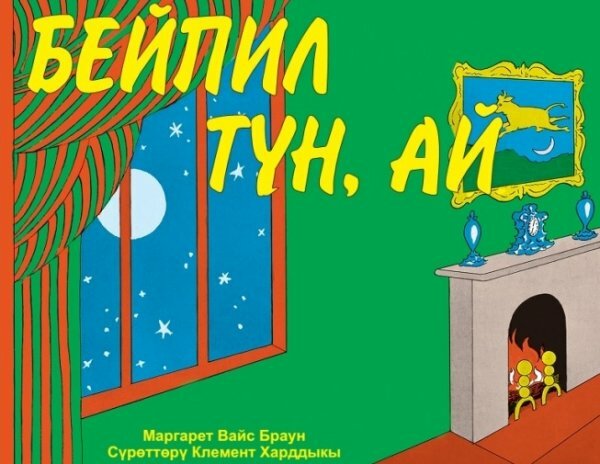 AKIPRESS.COM - One of the most highly acclaimed bedtime stories Goodnight Moon by American writer Margaret Wise Brown was translated into Kyrgyz language, according to the Literatura.kg. The book was illustrated by Clement Hurd and was published on September 3, 1947. The book is designed for the young children aged between two to five years. Turusbek Madylbai translated the book into Kyrgyz and the book was published in 4,000 copies. The book was published by the Association of Publishers in the framework of the READ program with the support of the US Embassy in Kyrgyzstan. All books translated into Kyrgyz as part of this program are donated to children's institutions of Kyrgyzstan. Goodnight Moon is classic children's literature in North America. The text is a rhyming poem, describing an anthropomorphic bunny's bedtime ritual of saying "good night" to various objects in the bunny's bedroom: a red balloon, the bunny's dollhouse, two kittens, etc. So far, such popular books as Kitten's First Full Moon by Kevin Henkes, Bridge to Terabithia by Katherine Paterson What Do People Do All Day by Richard Scarry, The True Story of the Three Little Pigs by John Scieszka, Blueberries for Sal by Robert McCloskey, and for young adults, The Catcher in the Rye by J.D. Salinger are available in Kyrgyz language.